Super Plastronics, a Kodak brand licensee, has launched Kodak 4K 43UHDXSmart LED TV in India. It will be available on Flipkart at an attractive price point of Rs. 23,999. This TV comes with a resolution of ­­­­­­­­­3840 x 2160 pixels with display size of 43 inches. The 43UHDX Smart TV is equipped with a Dual Core 1.4GHz processor coupled with 1 GB memory and flash storage of up to 8 GB. This TV comes with intelligent features like LAN connectivity, Wi-Fi, Miracast, and is pre-loaded with Apps like Gmail, Youtube, Twitter, Facebook, Hotstar and Netflix. 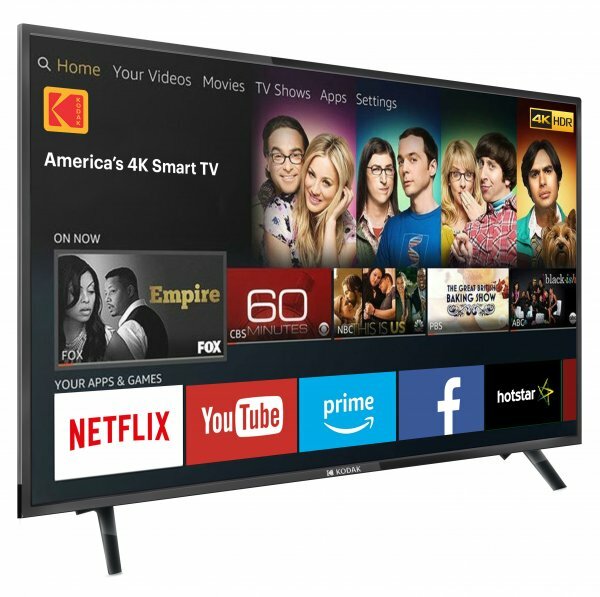 With the previous launches of the 55-inch and 50-inch Kodak 4K UHDXSmart LED TVs and today’s announcement of the 43UHDXSmart LED TV, Super Plastronics has cemented its dedication to expand and refine its 4K UHD product line in India to ensure that the Indian consumer gets superior technology at affordable prices as stated by the company in its press statement. The company has further stated that they are exploring a possibility of setting up a manufacturing facility in south India and has ambitious plan to sell 2 lakh TVs in the current financial year and take it to 3.5 lakhs units in 2019-2020.